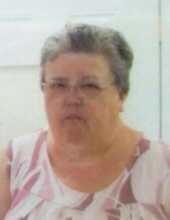 Patricia A. Noel, age 65, passed away Tuesday, April 2, 2019 at the Bluegrass Community Hospital in Versailles, Kentucky. She was born November 3, 1953 in Lexington, Kentucky to the late Deward Lee and Juanita Storey Noel. Pat was a retired teachers aide in the Scott County School System. She was a member of Sadieville Christian Church, a member of several homemakers clubs in Scott County, volunteered at the Senior Citizens Center and was the secretary of the Loyal Ladies Group at her church. She is survived by her three aunts, Mary Etta Mastin, Sandy Tribble, and Sue Sievert; her uncle Bill Storey and some very special friends that are her neighbors. Visitation for Pat will be Sunday, April 7, 2019 from 3pm to 5pm at Tucker, Yocum & Wilson Funeral Home. Her funeral services will be 2pm Monday, at the funeral home with Pastor Scott Meadows and Pastor Nick Skinner officiating. Burial will follow the service at Georgetown Cemetery with Dino Caywood, Barry Zumwalt, Larry Zumwalt, and Dann Smith serving as pallbearers. Memorials may be made in Pat's name to Sadieville Christian Church, 245 Main Street, Sadieville, Kentucky 40370. To send flowers or a remembrance gift to the family of Patricia A. Noel, please visit our Tribute Store. "Email Address" would like to share the life celebration of Patricia A. Noel. Click on the "link" to go to share a favorite memory or leave a condolence message for the family.